It’s unimaginably hot inside the swamp. The air sticks inside my throat, thick and wet. Despite wearing only a t-shirt, I start to sweat so much that droplets of water bead across my skin. It’s a sensory overload pressing up against my skin. The churn of water rushing through pipes. Far off hissing and creaking. Strange smells. The taste of metal and dust. And all around me, trees – of a sort. Well, planks and beams and wood slabs anyway. When the double sized metals doors at the back of the high school auditorium are flung open it’s hard to imagine the world beyond them would have been like this. It’s not hard to figure out why they call it “the swamp” but the nickname seems a little too on the nose when you’re knee deep in wood chips and the warm, strange air settles around you. The swamp is a scene shop. 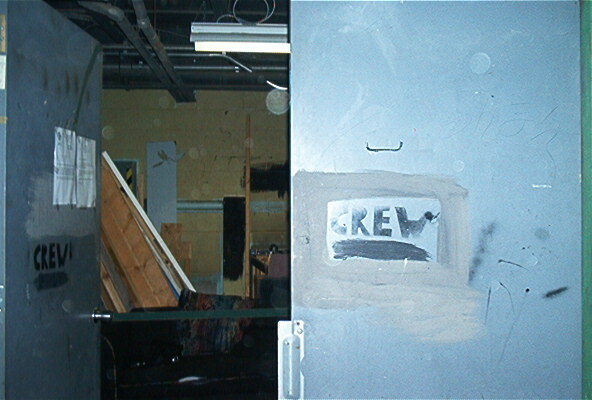 A sequestered, unassuming section at the back of my high school’s theater. The first time I see it, it feels like a hell I am being banished to. What I know about scene shops before that day couldn’t fill a thimble. I’m only even participating in stage crew because somehow, inexplicably, all my friends are here. I have no interest in theater, no interest in stage building, and I have less interest in being separated from everyone else in this oppressive space. I do know is that the “swamp” is supposed to be a functional space. A place where you build things and yet nothing can be built here because in reality, the floor of the entire room is lined nearly three feet deep with wood chips. What I know is that I’m banned from using the table saw and stuck in this hell landscape because one the stage manager saw me fall off edge of the stage walking backwards and decided I was a hazard to myself and others. What I know is the swamp is named well and the chaos inside of it makes my head hurt almost as much as the heat does. I stand aimlessly in the middle of things as people bustle in and out, carrying various tools I don’t know the names of. They push past me, digging deep into the broken shelves searching for the latest obscure thing they need. There are calls for hammers, calls for chargers, and ever present annoyed voices from the edge of the door waiting impatiently for the the swamp manager inside the door to find something, anything in this disaster. In all this useless clutter. I’ve always been stuck by a need to help but the entire room gives me pause. I wonder why it’s a mess. I wonder how anything got built or done around here for years because no place on Earth floods with wood chips overnight. My mentor, the swamp manager, roots around in a large bin with a cracked top for a specific piece of wood and he hurls it, bodily, out the door. He hardly has any time to think about getting things under control before more items are asked for. Clamored for. Huffing annoyances demanded of him. He turns and from his pocket drops something into the wood chips. It disappears forever. I was just going to leave but I can’t help thinking to myself: Oh my, this won’t do. I pull my sweater off and tie my hair up in a tight bun. There’s a large trash can in the corner, buried halfway like everything else, and near it there’s a shovel on the wall and for the first time in a long time it feel pretty clear why I was put on this Earth. To fix this. To make this a swamp instead of quicksand. It takes months. It takes bodies and hands and talking everyone into it. It takes time and effort and energy no one wants to give because all around me, as I shovel and arrange and inventory – a whole stage is being built outside these walls. Half-built pieces take up residence on a cabinet I was sorting, wood with marking appears in the middle of room blocking my path, and the whole damn time it’s hot as hell inside. That’s not even mentioning the people. After the initial excavation process there’s, inexplicably, a couch in the swamp. A ratty thick black thing that when sat upon feels like a living puddle. It creaks and sinks and smells and yet it is always populated by people. Chatting. Crying. Laughing. Alive people. They bring their drama inside, they slow me down and speed me up depending on their mood and their candor but they’re as omnipresent as the heat, sweat, and music I let roll through the scene shop. And the people, well, they help make the swamp something even more useful to me than a scene shop: a home. And it is, to me, a home. It’s the first home I build with my own two hands. It’s the blueprint for the rest of my life. My first real lesson in building something beautiful and solid out of something others have discarded. I take the entire shop from something disgraceful that people want nothing to do with and I turn it into somewhere people gravitate towards. Somewhere so beloved and safe that people go there when things get bad. All you have to do to open the door without keys is bend a hanger and wiggle the end into the lock and the door clicks open easy as can be. And sometimes, when I couldn’t imagine living in this world for one more minute I found myself in front of that door, breaking into the swamp. I’d skip class and lock myself inside as if it were a safe room instead of a moist, hot mess filled with disused tools and wood portions. I’d lay on the world’s most disgusting couch and let the warmth around me substitute for arms. I would let it keep me and eat me alive.